training, and socialization. Puppies with nice temperaments are curious and playful, willing to approach people and be held by them. Choose the middle-of-the-road puppy, not the one who's beating up his littermates or the one who's hiding in the corner. Always meet at least one of the parents — usually the mother is the one who's available — to ensure that they have nice temperaments that you're comfortable with. Meeting siblings or other relatives of the parents is also helpful for evaluating what a puppy will be like when he grows up. Like every dog, the Goldendoodle needs early socialization — exposure to many different people, sights, sounds, and experiences — when they're young. Socialization helps ensure that your Goldendoodle puppy grows up to be a well-rounded dog. Enrolling him in a puppy kindergarten class is a great start. Inviting visitors over regularly, and taking him to busy parks, stores that allow dogs, and on leisurely strolls to meet neighbors will also help him polish his social skills. brush it about once every week or two. If he's clipped, he'll still need a good brushing every few weeks. The Goldendoodle requires a bath only when it's absolutely necessary, or his coat and skin will lose necessary oils and moisture.Brush your Goldendoodle's teeth at least two or three times a week to remove tartar buildup and the bacteria that lurk inside it. Daily brushing is even better if you want to prevent gum disease and bad breath.Trim nails once or twice a month if your dog doesn't wear them down naturally to prevent painful tears and other problems. If you can hear them clicking on the floor, they're too long. Dog toenails have blood vessels in them, and if you cut too far you can cause bleeding — and your dog may not cooperate the next time he sees the nail clippers come out. So, if you're not experienced trimming dog nails, ask a vet or groomer for pointers. His ears should be checked weekly for redness or a bad odor, which can indicate an infection. When you check your dog's ears, wipe them out with a cotton ball dampened with gentle, pH-balanced ear cleaner to help prevent infections. Don't insert anything into the ear canal; just clean the outer ear. 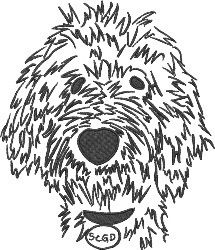 Begin accustoming your Goldendoodle to being brushed and examined when he's a puppy. Handle his paws frequently — dogs are touchy about their feet — and look inside his mouth. Make grooming a positive experience filled with praise and rewards, and you'll lay the groundwork for easy veterinary exams and other handling when he's an adult. As you groom, check for sores, rashes, or signs of infection such as redness, tenderness, or inflammation on the skin, in the nose, mouth, and eyes, and on the feet. Eyes should be clear, with no redness or discharge. Your careful weekly exam will help you spot potential health problems early.